Last week, new credit card rules went into effect. And not everyone is happy. There are reports of new fees being assessed. So we open the letter and learn we are going to be charged an annual fee of $60. BUT – if we make at least $2,400 in purchases throughout the year, we get our $60 back. Now isn’t that special? Spend $2,340 to get back $60? I heard a report on Fox News this weekend this is one way credit card companies are going to recoup their losses from no longer being able to jack up interest rates on people. It was a gasoline card. You know, one of those where you're at the pump, filling up, and there's a credit card application in a little box on the pump? But Chase turned her down. 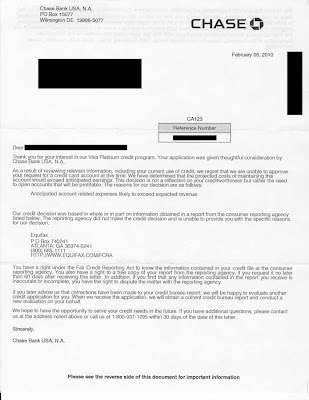 Bad credit? Nope. For good credit. What does "Anticipated account related expenses likely to exceed expected revenue" mean? Let's break that down. Account related expenses: That's the cost to print the card, print the statements, pay the postage, etc. Expected revenue: That's fees, interest, and such. You see, my friend pays all her credit cards off and rarely, if ever, carries a balance from one month to the next. She doesn't pay a lot of interest. And no late fees. Or over-limit fees. Or anything like that. She handles her credit card well. Very, very well. So well, the bank figures that, based on her credit performance, they won't make enough money off her to buy the stamps to send her a bill. So now you know: Banks like Chase aren't interested in offering cards to responsible people. They want to issue cards to people that don't handle their money so well. Like me. They want to take a risk. We all know how well that worked out before. Really. What could go wrong. Basil, I know what you're saying. But, you really can't blame them. No interest, no profit...unhappy stockholders. I have myself, in my business, declined to fill orders that would cost me more than I would make. There are very few...and it's a LONG story as to how that is possible...but it is. Chase is in the biz to turn their evil profits. Every cardholder like your friend really does (could) cost them money. Of course, there are the merchant discounts that are charged...but I'm not sure what percentage of that 2 to 3 percent actually goes to the cardholder's bank...I know a good bit goes to the processing company (in my biz, I use First Data.) I'm pretty sure that they grab the lion's share of the discount I pay. Sure, everyone is in business to make money. And I can understand if someone has bad credit; if their history says they'll take your money, don't take the risk. Yes, you made some good points that there are other expenses a bank has with credit cards. You mentioned processor First Data; here in Columbus, another processor, TSYS, has its headquarters. It wouldn't be appropriate for me to comment on the processing details. You have used them in business more recently than have I, so I defer to you. My friend drives, has a house, and pays her taxes. She'll need another car one day. She'll buy new furniture. She'll buy electronics. She'll take trips. In other words, there are opportunities for them to be the financial institution that she'll use when she makes larger purchases. But Chase doesn't want to do business with her. If a simp like me can understand it, then you done good making it! Chase is likely cutting off their nose to spite their face by not taking on good credit risks as customers. Probably VERY short-sighted...but that's not news for a bank, huh? My #2 son worked for Chase in (the other) Columbus...where they root for Buckeyes. He worked in the mortgage loan dept. It drove him literally bat guano crazy...not the customers...his superiors, and the bank policies.